Why are so many people attracted to Bernie Sanders’ campaign? The self-described socialist has won the support of millions. More than 100,000 people were excited enough to attend 3,500 meetings throughout 50 states on July 29. 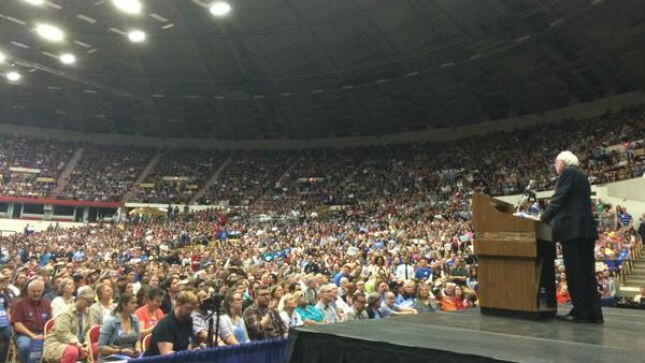 In August and September Sanders drew huge crowds in Minneapolis, Denver, Madison, Phoenix, Council Bluffs, Seattle (12,000), Portland, Maine, Portland, Oregon (20,000), Los Angeles (27,000) and Boston (somewhere between 25-30,000). By the end of September he’d received donations from 650,000 people—including $25.5 million mostly in small donations in just three months. On the labor front, he held a conference call of 26,000 union members in September, with 1,350 of them volunteering to work on his campaign. All this is not because Bernie Sanders is a Democrat. He has spent only five months of his 43-year political career as a nominal member of that party. In the Democratic Party today he remains an isolated outsider, with none of its major leaders offering him any encouragement, let alone political support. Although Sanders caucuses with the Democrats and almost always votes with them, against the Republicans, before his presidential run he was most famous for being the longest-serving independent in Congress. He’s introduced legislation for a $15 federal minimum wage, for free college tuition, and for tight financial regulation and reform that the corporate-tied Democratic leadership won’t touch. We disagree with Sanders’ relative silence on war and the military budget, but whatever his weaknesses, they don’t make him acceptable to the Democratic leadership. Sanders has the best voting record in Congress as judged by the AFL-CIO, the American Civil Liberties Union, the National Organization for Women, and the NAACP. But that’s not the reason people are “feeling the Bern”–many of his supporters have never been involved in mainstream political organizations. Some are Democrats, some are independents, some are non-voters. Sanders has been drawing crowds in the tens of thousands. What Bernie enthusiasts have in common is that they are excited and relieved to find, for once, a candidate they don’t have to hold their nose to vote for. They’ve pulled the lever for “lesser evil” corporate Democrats like Hillary Clinton before, against right-wing Republicans, but they’re fed up with the idea that those are the only two choices. Many Sanders supporters despise Clinton’s cynical politics. They support Sanders because they see him speaking up for society’s economic underdogs. While Hillary Clinton sat on the board of Walmart, Bernie Sanders was marching on union picket lines. Today he stands with those workers fighting for $15 an hour and to get out from under student debt and to form new unions. He demands that we drive corporate money out of politics; he argues for universal health care and free college. And he was moved by the intervention of the Black Lives Matter movement to make a strong statement on institutional racism and police violence. Bernie Sanders’ supporters in the unions are challenging the labor officialdom’s longstanding, unquestioned, and virtually unconditional support for the Democratic Party leadership and organization. When President Randi Weingarten and the executive council of the Teachers union endorsed Clinton without any discussion among the members, thousands of AFT members protested. In the other teachers union, the NEA, an early endorsement of Clinton has ignited a similar rank-and-file firestorm. In the International Brotherhood of Electrical Workers, member activism has gotten leaders to say they won’t endorse anytime soon. Labor for Bernie, the group that organized the 26,000-person phone call with Sanders, brings together members who have seen their unions disrespected for decades, and who want to challenge both the economic and political state of affairs. They want to challenge their bosses and force the government to recognize their rights, and many are finding that they have to oppose their own union leaders to do so. Sanders has always called himself a “democratic socialist,” but that did not feature so much in the first couple months of his campaign. With every new interview it has become more prominent. The Tea Party’s attack on the Affordable Care Act (Obamacare) as “socialism” was false, but ironically, for the first time in decades, it opened the door to a positive discussion of socialism. In 2014 Kshama Sawant won a seat on the Seattle City Council, showing that once again (as was true 100 years ago) a socialist could win political office in America. Sanders has made it clear that his model is “social democracy” in the Scandinavian tradition: free health care and education for all; good jobs and wages with excellent unemployment insurance, public housing programs, and a generous conception of the public good and social well-being. “In Denmark,” he says, “it is very hard to become very, very rich, but it’s pretty hard to be very, very poor. And that makes a lot of sense to me.” Health care and social protections are under attack in Europe, too, but since they started at a higher level, these societies remain far ahead of the United States in the quality of their citizens’ lives. However, these social programs exist within the context of a capitalist system that still creates inequality, exploits labor, and still goes from boom to bust. In fact, capitalism makes impossible many of the ideals that social democrats themselves aspire to. Militarism, too, can’t coexist with Sanders’ ideals—for one thing, defunding the war apparatus would be a great place to get the money for health care and education. Sanders stresses that the movement is not about him, that a president alone cannot make the change we need. He calls for a “political revolution,” which, he says, means more than “tinkering around the edges of American society.” It will take, he says, millions and millions of people getting involved. Today we see movements that are getting people involved: Black Lives Matter, the Fight for $15, the victorious marriage equality campaign, the fight against fracking. All contain new activists who are looking for an understanding of our society and a fresh politics. It is seekers like these who could start an ongoing and independent political movement. Back in 1988 Jesse Jackson appealed to the movements in his Democratic primary campaign for the presidency–but then dismantled the Rainbow Coalition that had supported him, incorporating his supporters into the Democratic Party. Sanders’ campaign has the potential for going beyond a futile pressure group within the Democrats. Together with other movements, it could help lay the groundwork for an independent populist political movement. The lesson that Sanders’ supporters should take from the Jesse Jackson and Dennis Kucinich experiences is that realizing this potential will require an exit route from the Democratic Party. More long-term, the choice is between giving up and going home once election season is over, and staying active in all sorts of movements that challenge politics as usual. The Democratic Party is not an empty vessel which a movement for “political revolution” can fill with its own ideas and own supporters. If it were possible to take over that party and use it to fight the power, it would have happened earlier—maybe in the 1930s, or in 1972 when antiwar candidate George McGovern was nominated and then deserted by the party establishment. No, this party is a longstanding institution, a convenient vehicle for perpetuating the dominance of the capitalist class–the banking, hedge fund, and corporate executives who mostly, but not exclusively, favor the Republican option. Both Barack Obama and Hillary Clinton are the darlings of a big section of Wall Street as well as of other capitalists who don’t follow the extreme right wing on social issues. Just follow the money to find the biggest contributors to their campaigns. The leaders who control the Democratic Party have no intention of allowing Bernie Sanders to get anywhere near the presidential nomination. In the end, they need the votes of his supporters and the energy his campaign generates, but they’ll do whatever is needed to stop his momentum. That could mean rallying around Clinton, finding a substitute corporate candidate in the event that she slips badly, or relying on the super-delegates (elected officials who get to vote at the convention without regard to the outcome of their state’s primary). And if they need to pour on some dirty tricks to extinguish “the Bern,” they won’t hesitate. Young people’s anger over low wages and McJobs, Black people’s anger at police brutality and murder, the awakening working class anger against corporations and corporate government, the labor activism around the Sanders campaign, the opening to socialist ideas, the enthusiasm for a bold economic program, the call for “political revolution”–all indicate the potential for an insurgent movement. But the paradox is that such a movement would need a new political party. How could the Democratic Party, where the levers of power are controlled by banks and corporations, professional politicians and their fundraisers and advertising agencies, ever tolerate a candidate and a campaign that would break their hold? For Bernie Sanders’ supporters, Jill Stein’s campaign represents what you’re fighting for right now. The voices of protest and indignation can continue making themselves heard at the ballot box. Around the country, there will be referenda on social justice issues and local independent candidates running as pro-people renegades against the Democratic Party machine. Our support should uncompromisingly follow our political convictions if our “revolution” is going to take off. The political revolution is all of us–we are the power. More important than any candidate’s electoral campaign is what we do to build movements and organize people to challenge neoliberal policies—and eventually, to challenge capitalism. Join the movement to combat climate change. Fight for $15 an hour. Support Black Lives Matter. Work for universal health care. Make your union into a force that matters, or help organize your workplace. Join those who are fighting to reduce student debt. Oppose the demonization and deportation of immigrants. Join in international solidarity with the victims of imperialism around the globe. To win the aspirations that Bernie represents will take all the movements, in the streets–before, during, and after the elections. The article below was written as a response to the Solidarity position on the Sanders campaign printed in ATC #178.Although I agree with the Oct. 8th “What’s Next” statement (above), it still takes a position of “outside looking in”. We all would like to see the rebirth of a vibrant socialist movement in the aftermath of the Sanders primary campaign which, of course, is time-limited. But that time is not yet and, for reasons I suggest in the article, it would be sad if we missed the opportunity to influence the campaign and those it persuades from within. As a Solidarity supporter I was mostly pleased that the Solidarity statement on the Bernie Sanders’ campaign (Against The Current #178). did not take the knee-jerk sectarian opposition of some other left groups. On the other hand, the statement fails to understand the distinction between running in a Democratic Party primary and joining or working within the Democratic Party. American campaigns are divided into a primary season and an election season. Sanders is running against Hillary, not the Greens or any other independents. After Bernie is defeated, he has said he will not be a “spoiler”. He will doubtless endorse Hillary. Not only Sanders’ supporters but many far to his left will pull down the Hillary lever. Does this mean they will choose to work in the Democratic Party rather than to take the path of building an alternative movement? That depends partly on how the Sanders campaign develops and partly on how effective socialists can be in influencing it. This leads me to my main criticism of the Solidarity position. It chooses to stand outside of the campaign rather than to work within it. While this may maintain ideologically purity, it is about as effective as standing outside of a union struggle and telling the workers what we think they ought to do. The thousands of young people who have chosen to work for Sanders are more likely to listen to the ideas of their co-workers than to those who choose to remain outside telling them they are wasting their time and heading for a dead end. Just as unfortunate is Solidarity’s total failure to appreciate the significance of Sanders’ self-identification as a democratic socialist. Sanders is a strange duck in American politics. Elected to the Senate as an independent, he caucuses with but refuses to join the Democratic Party. It is this socialist self-identification and refusal to join the Democratic Party that distinguishes him from the Jacksons and Kuciniches who use the primaries merely as a way to nudge the presumptive Democratic candidate to the left. The primaries offer an opportunity to reach millions through the debates and talk shows which the media has denied to independents. I’m sure Sanders gave much thought as to whether or not to run. Since he is not delusional, I assume he is doing it to reach people with his ideas rather than to hang a picture of his hero, Eugene Debs, in the Oval Office. All of Solidarity’s criticisms of Sanders are, of course, correct. Although he calls himself a democratic socialist, his present politics are social democratic. His positions on war and Israel vary between bad and wishy-washy. He hasn’t learned how to turn his strong position on civil rights into a powerful outreach to the Black and Latino communities and, while he claims to prefer a working class to a liberal orientation, this has yet to materialize in his campaign. I’m sure much more can be found. More important, though, is that Sanders’ socialist identification has made curiosity about socialism a mainstream issue. Not in my memory has a candidate given such a gift to the left. Despite pressures to do so, Sanders refuses to renounce his socialist identity. This gives us a fine educational opportunity to describe what we mean by socialism-from-below to his fellow workers. There has been a sea change in attitudes towards socialism, and not only among young people. A recent poll indicates that Sanders could easily defeat Donald Trump and scores well against other Republican candidates. Can one imagine, a few years ago, a majority of Americans preferring for President someone who calls himself a socialist over a leading conservative? This could be a turning point in the effort to build a socialist left in America. It is time for Solidarity to reconsider its position on the Sanders campaign. It does not take a climate scientist or even a particularly bright bulb on the street to see that Capitalism, unrestrained by the requirements of Planetary life support systems, is guaranteed mutually assured destruction. When dollars are sacrosanct to Planetary life support systems, what other outcome can be expected? Socially enabled capitalism is clearly a failed paradigm. Help end tax funded pollution of the commons for starters. Our tax dollars are funding a Planetary ecocide future for the children of ALL species. “War becomes perpetual when used as a rationale for peace,” Norman Solomon. “Peace becomes perpetual when used as a rationale for survival.” Yours truly. Bernie understands this and this is the reason he will not accept big money donations. Take their money and they expect a ROI. Take our money and we expect representation. Sorely lacking for the 74 years of my lifetime with but a few transgressions.